I really enjoyed a few cold beers the night before, and I wouldn’t mind sleeping for another hour. But it was time to begin the day, take the morning walk with the dog, have breakfast and get going. 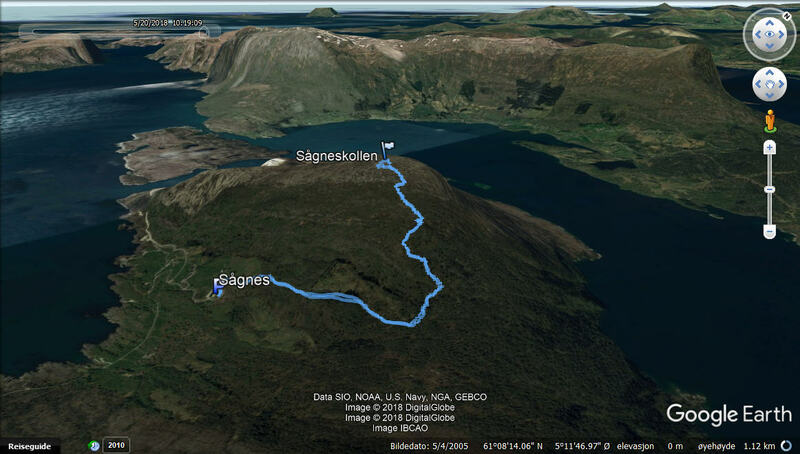 I started with the longest drive of all – to Sågnes. 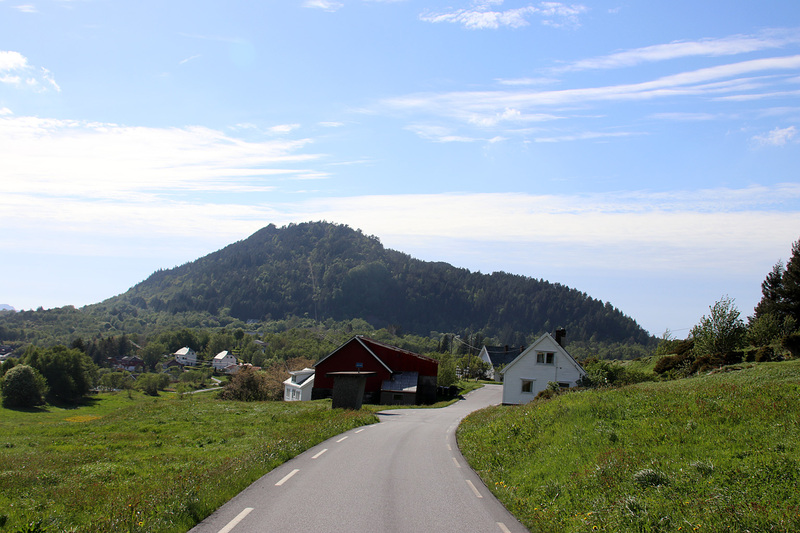 To get there, I had to pass Hyllestad, Leirvik and Rysjedalsvika before driving around the peninsula to the Sågnes farms. At least I could start at 100m elevation. I expected a well worn path and found one. I followed the path eastbound for 0,9km until the path turned north/northwest and climbed steeply up the mountain. It was a bit windy with some really strong gusts. Gale-ish. The hike up the mountain went slow. My feet were not like the day before, but I assumed they would get going sooner or later. 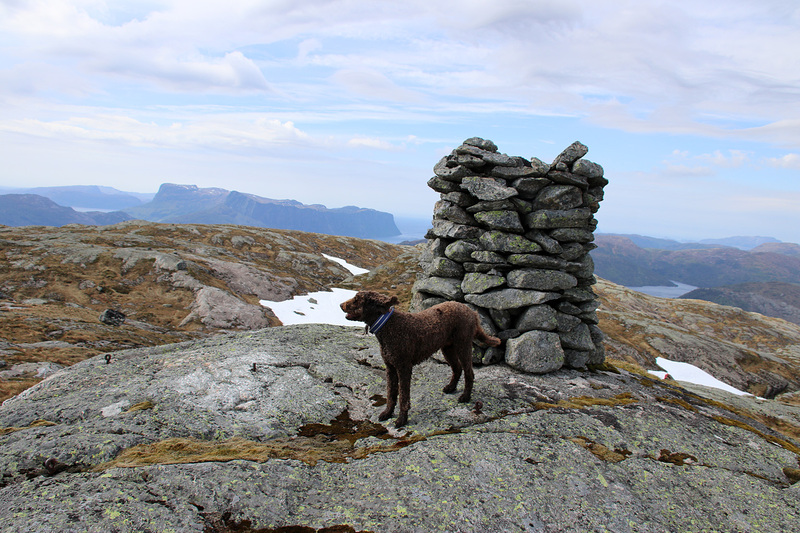 And it felt really good to reach the top and enjoy the mighty Lifjell massif to the north. I’ve had some very memorable hikes up that massif. The descent went considerably faster than the ascent, and back at the car I did a quick “Yai!” for new top #5 this weekend and sat course for my next top. Trip statistics: 4,3km, 410 vertical meters, 1h:12m. According to the map, it should be possible to get to the top of Bøheia without too much pain (read: bush). 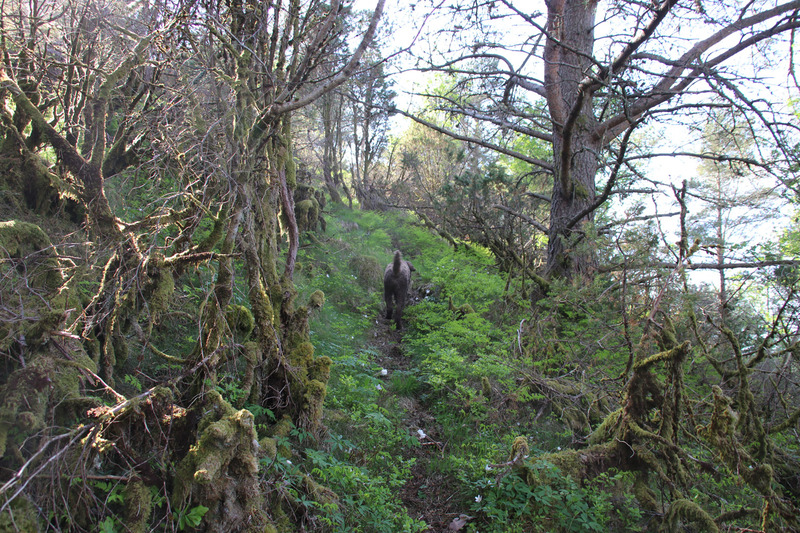 There was both a tractor road and a path, and even if they would be overgrown, it would be far better than off-trail in the bush. 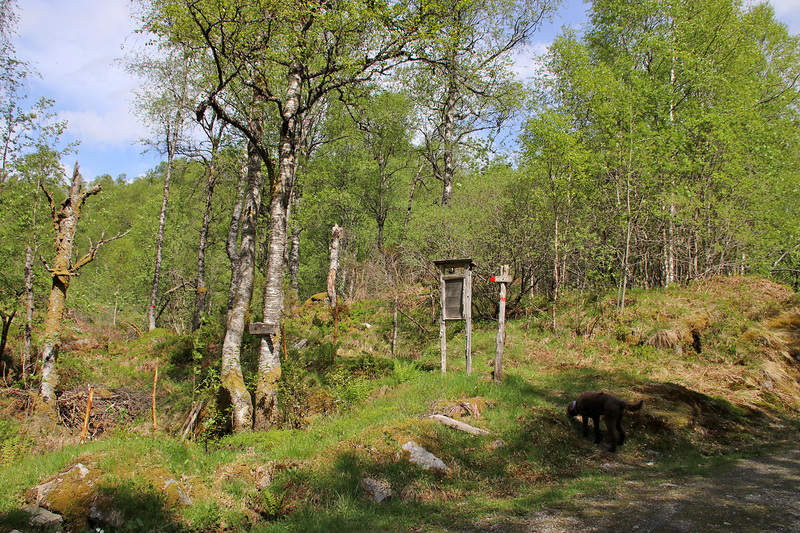 I drove to Ytre Bø and found a Bøheia signpost at the end of the paved road. I decided to park there, and soon noticed that I could have driven another 0,3km. 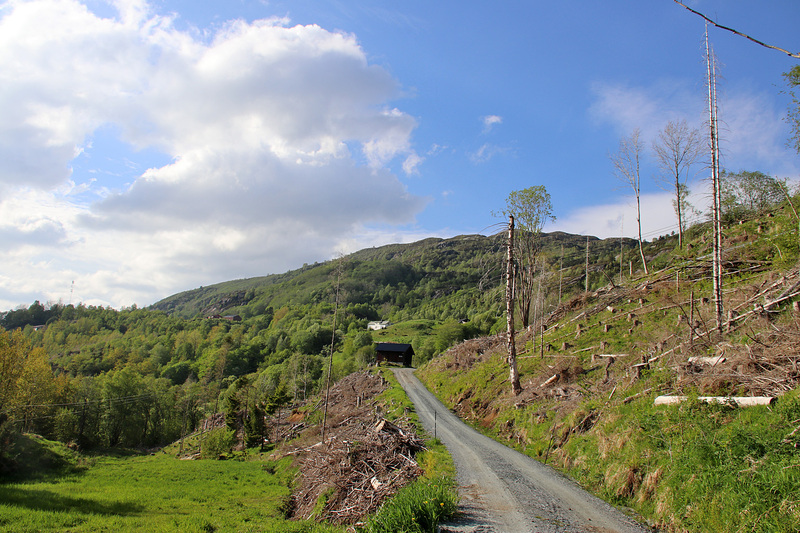 I then followed a tractor road for 0,8km until I reached the forest path. The path was easy to follow and I could tell that this is a popular hike, even if there wasn’t much to see from the top, because of trees. Trip statistics: 4,2km, 300 vertical meters, 1h. 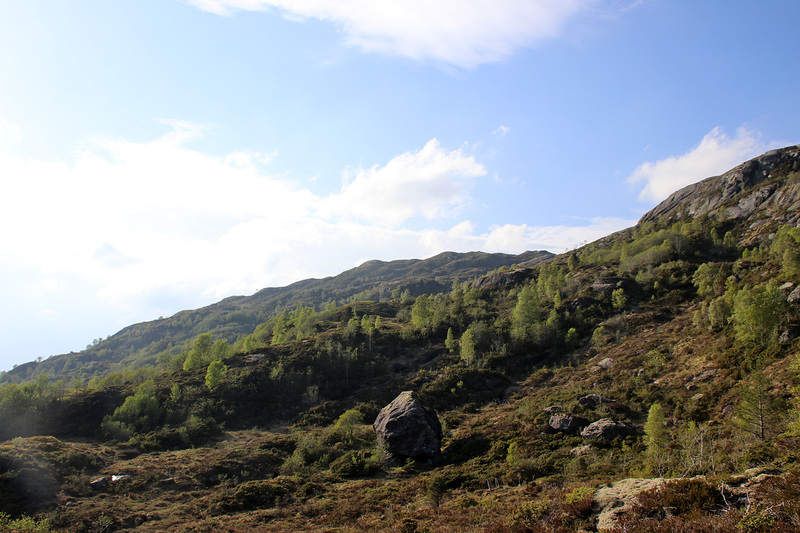 There are a few rugged forest tops just east of Leirvik and Klettheia is one of them. This could be easy or this could be extremely painful. In Leirvik, I pulled over and asked a woman passing by for any advice she could give. She had lived there for thirty-some years and had never heard of Klettheia. No wonder, as it didn’t seem like a place people would go for a hike. Her original dialect hadn’t worn off and I asked her if she was from Helgeland (northern Norway). “Yes, from Brønnøysund”, she replied. 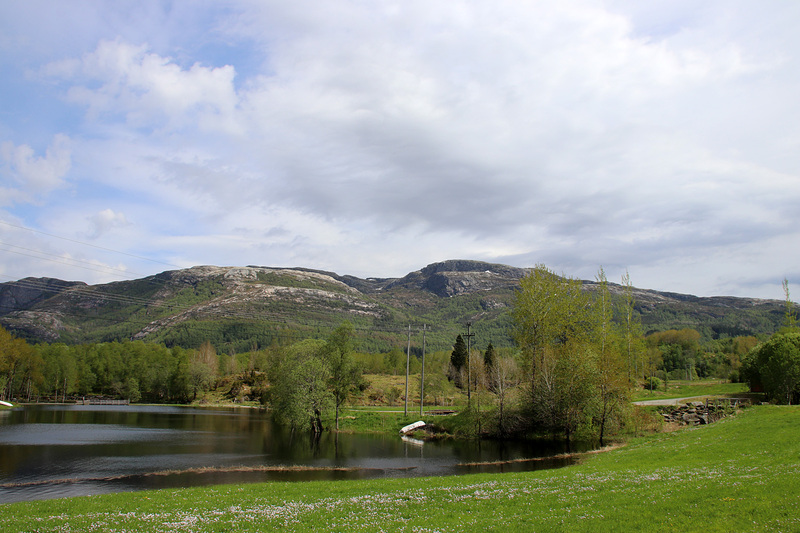 “I’m from Velfjord“, I said (Velfjord is close to Brønnøysund) and she could hardly believe the coincidence. After a nice chat, I decided to find my way up Klettheia without further assistance and drove to the farm Kletten on the northeast side. 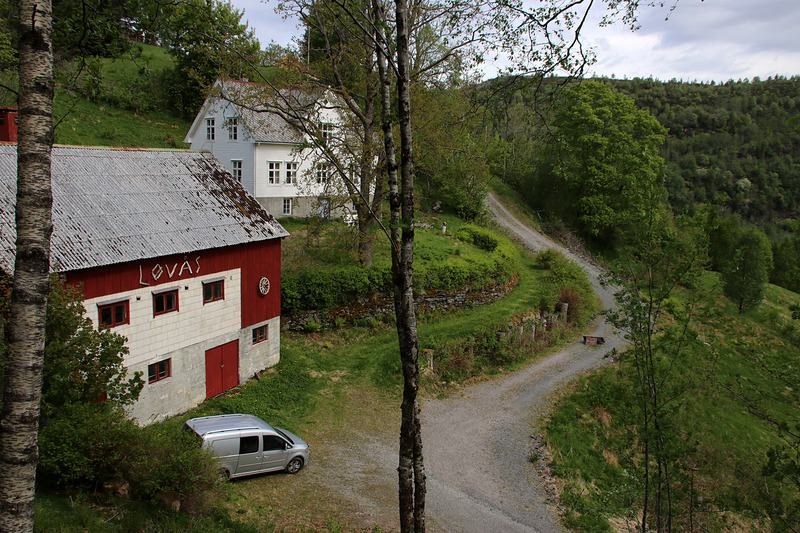 Or is it Løvås? At least that was what the barn said. Amazingly enough, I found a deer track right away, and – deer are not stupid animals. They will find the path of least resistance and their tracks led me to the top without any pain at all. There was a bolt in the ground where I assumed the high point was. 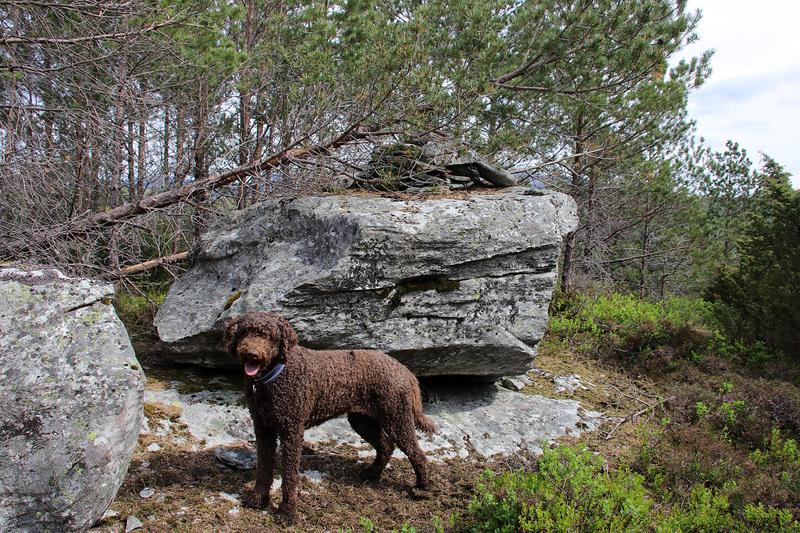 Then I discovered a huge rock a few meters away, and there was even a small cairn on top of it. The high point definitely in the bag! 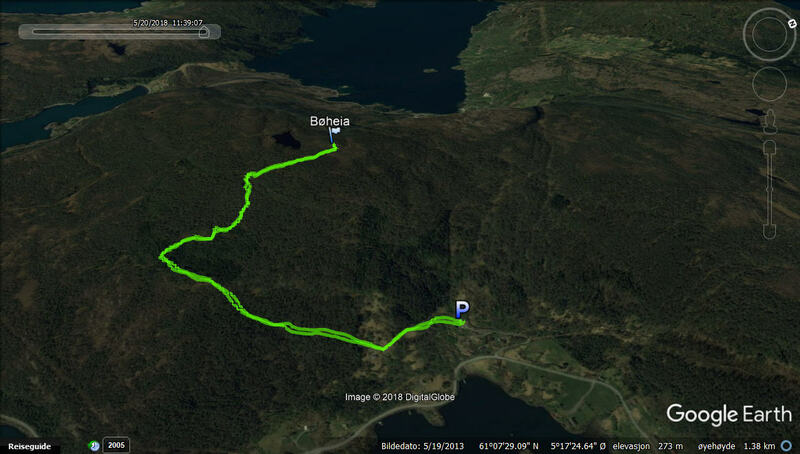 Trip statistics: 0,6km, 65 vertical meters, 15 minutes. 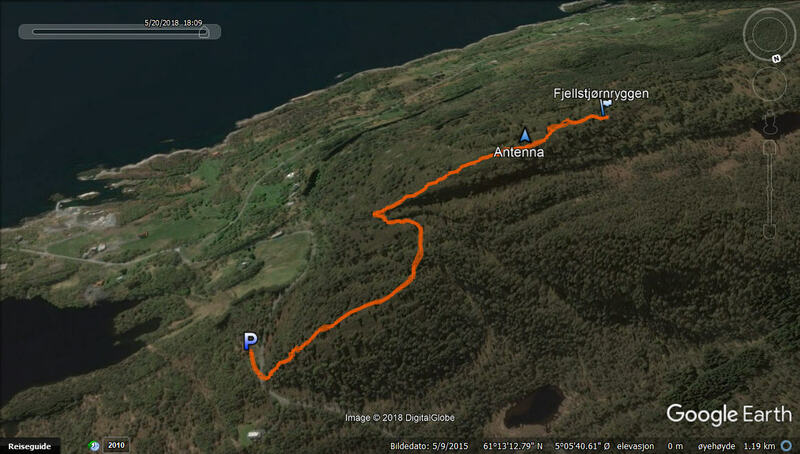 Now it was time for a proper hike again, and I decided to go for Blåfellet, close to the Fjaler border. 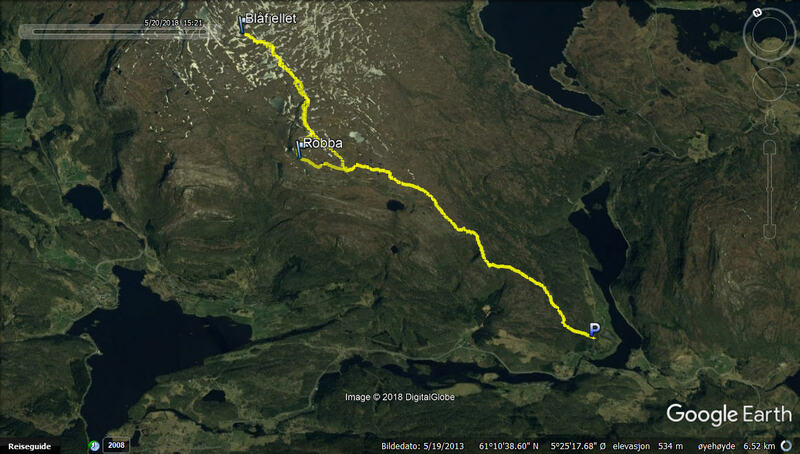 I had two options; a) hike from Bog – clearly the longest walk and b) Gudmundsosen by Nordstrandvatnet. I chose a) because it was a ridge walk, and I assumed that the b) route could be wet – at least in the beginning. Once back where I turned around, I could now enjoy a natural path in the terrain, smooth rock and easy to hike. 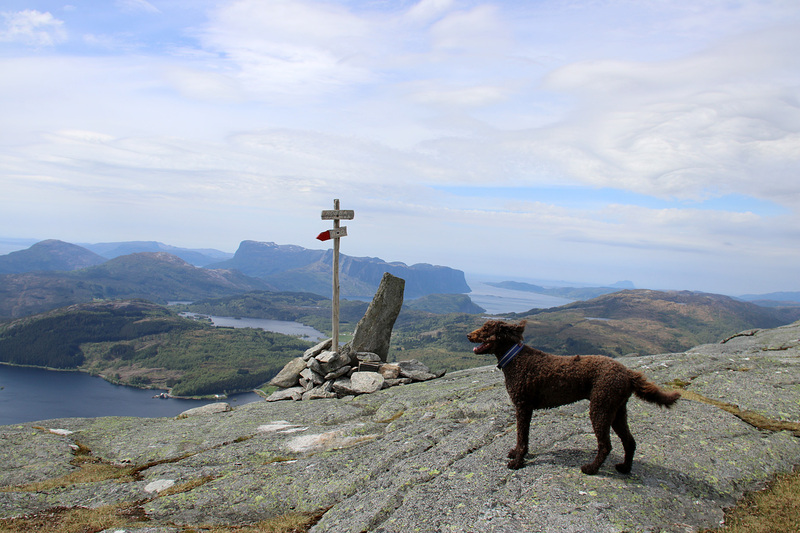 I had understood that people do this hike to visit Robba – which is not the high point on this mountain. Hence, I was curious about what was so special with Robba. I met a few hikers coming down the mountain, and had a long chat with one of them. I confirmed my suspicion about the choice of routes. Yes, the route we were on was clearly the longest, but also the finest. After a while, I reached Robba, and passed a family on their way down. It was truly a beautiful viewpoint and I could now well understand why people would come up here. But my goal was 1,3km to the north, which felt short, but looked far. 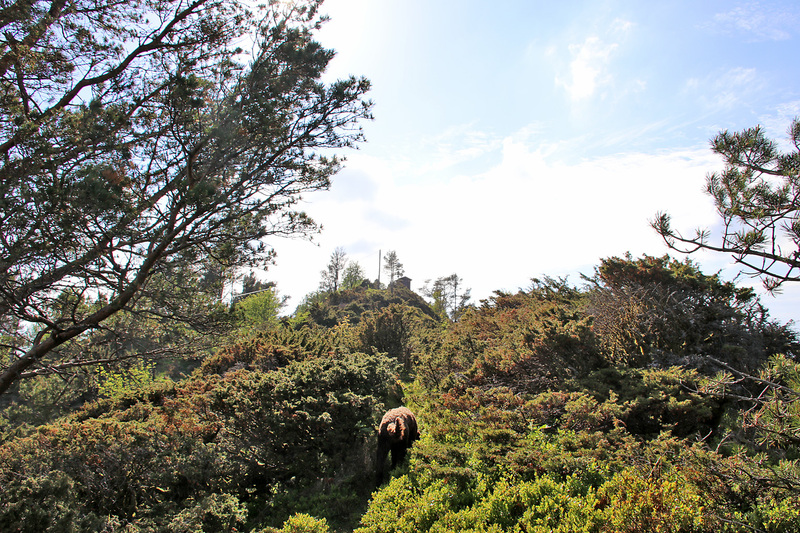 Fortunately, the path was marked onwards, so it helped me pick the easiest route to Blåfjellet. I’ll admit I was quite glad when I reached the high point and could look forward to – for the most part – a long and nice descent. Trip statistics: 10,5km, 670 vertical meters, 2h:55m. 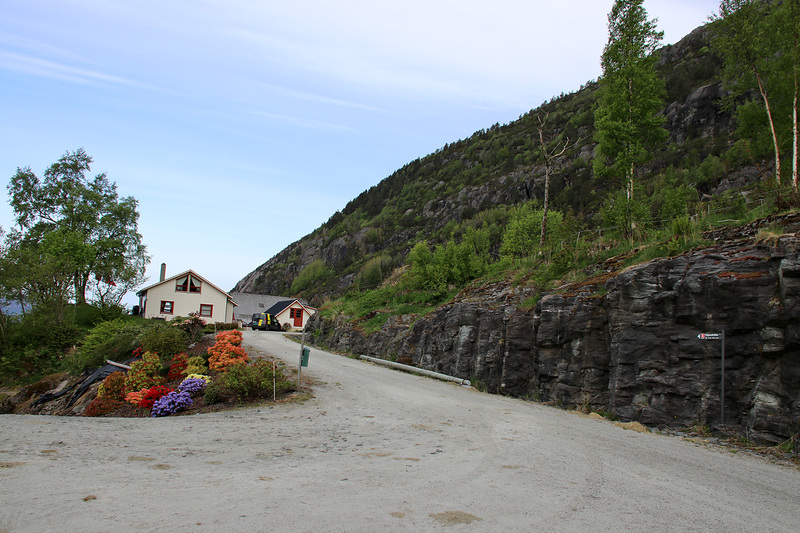 Fjellstjørnyggen was only a 15-minute drive from the cabin. And with the modest height, I hoped it could qualify as a “bonus top” (little effort). But as I got closer it to it, it looked like a nightmare. I stopped a meeting car and asked if there was a path. They didn’t know and recommended I’d talk to the persons in the other car behind them. They knew even less, so I decided to figure this out by myself. 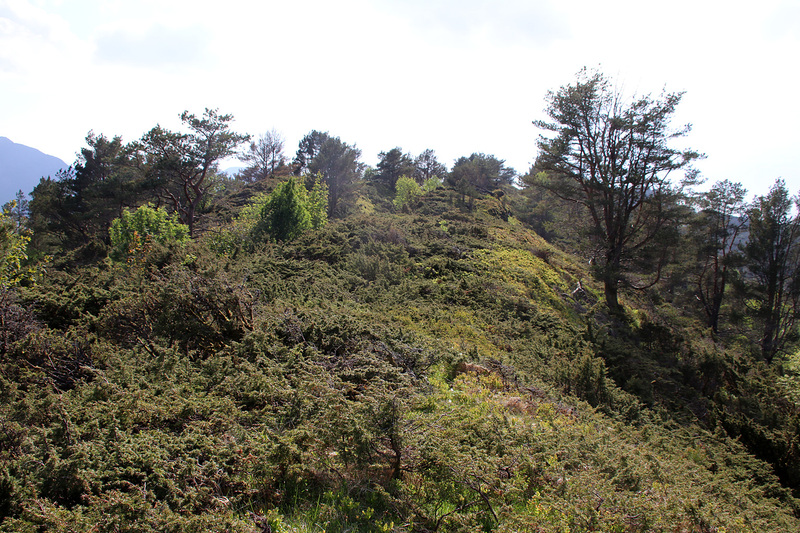 After a while, I concluded that if it hadn’t been for this path, it would be impossible to get to this top outside the winter season without technical aid – being a bush-cutting device. 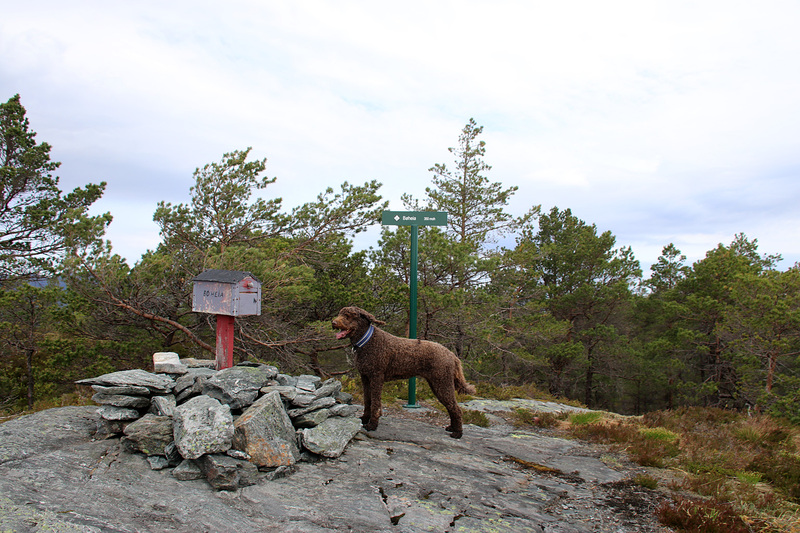 The path took us up to the antenna, but there was still 0,2km to the high point. And there was no more path. Those 2×200 meters were NOT friendly. The time as 6:09pm when I returned to the car, and even if every part of me wanted to return to the cabin for dinner and a cold beer (or two), I just KNEW that I wouldn’t be happy unless I did top #6 for the day. Trip statistics: 2,5km, 205 vertical meters, 46 minutes. 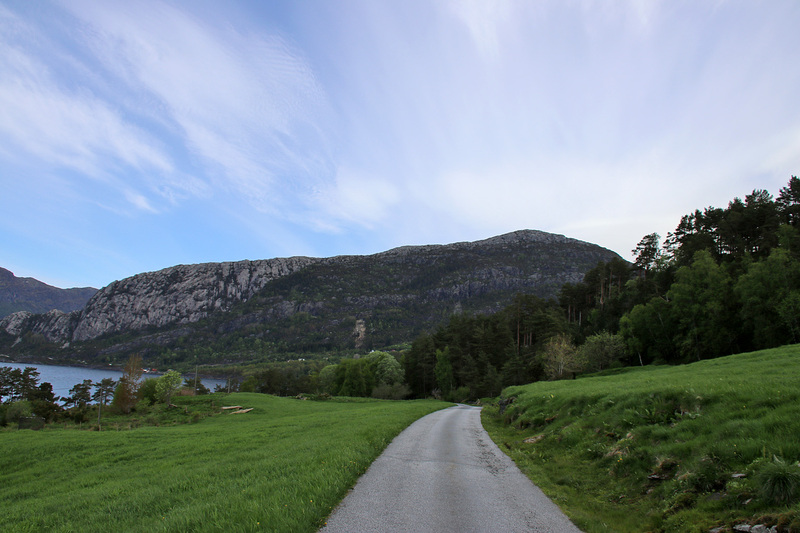 So I drove to Berge (near Hyllestad) and followed a road up to Ytreberge. The map promised a path, but I had my doubts when I got there. I went past the (abandoned) house and searched the backyard for a path, and found one close to the creek. 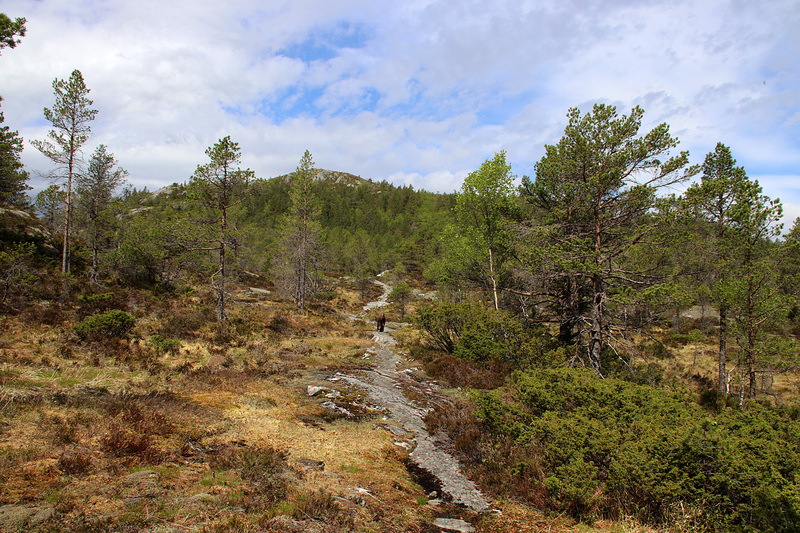 The path guided me through bush terrain up to 300m elevation, where I lost track of the path. I understood the general direction – go east (away from Bergsheia) and follow the high ridge back. 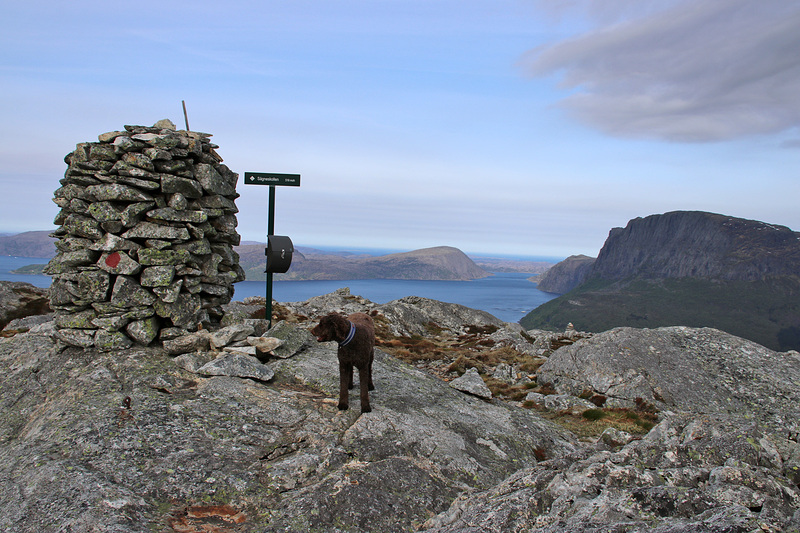 So I took a steep short-cut and got on the ridge just west of Hesjetinden. From here on, it was an easy walk up to the high point. Tempted as I was to hike directly south, back to the car, I think I made the right choice to return along my ascent route. It was now past 8pm and I was fed up from hiking. I had been in Hyllestad for 30 hours and had 10 new tops in the bag. I figured that wasn’t half bad and had earned myself a nice afternoon at the cabin.